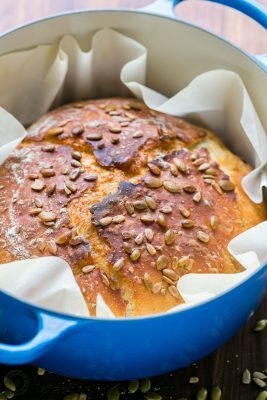 Dutch Oven Bread is surprisingly easy to make! This 5-seed NO-KNEAD dutch oven bread has a soft, spongy crumb and tastes like a loaf from a fancy bakery. Line work surface with parchment paper and trim the corners to fit better in the dutch oven. Sprinkle the center 9" of parchment with 1 Tbsp cornmeal or semolina and set aside. In a large bowl, combine 1 1/2 cups warm water, 2 Tbsp honey and 1/2 Tbsp salt. Stir until honey dissolves then sprinkle with 3/4 Tbsp yeast. Let sit at room temp 5 min. Stir in 3 cups flour and all the seeds. Stir with spatula until it comes together and seeds are incorporated (no kneading required). Dough will be very sticky. Cover bowl with lid or plastic wrap and rest at room temp (70˚F) for 2 hours or until tripled in volume. Sprinkle dough with flour and use a spatula to fold dough in half then fold in half again. Sprinkle generously again with flour and with well floured hands, lift up the dough and form a ball in your hands. Place over the center of your prepared parchment paper with the folded seam side down. sprinkle the top with extra seeds if desired. Let rise uncovered at room temp for 40 min. *To accurately measure flour: spoon flour into measuring cup and scrape off the top with the back of the knife. **If you aren't able to find toasted seeds, toast them on a dry skillet a few minutes until golden and fragrant.